A thin vanilla glaze adds just the right touch of sweetness to these scrumptious scones filled with bits of tart green apple and plump golden raisins. They're perfect for an afternoon tea or a Sunday brunch. Preheat oven to 425°F (220°C). Lightly grease a baking sheet; set aside. In a mixing bowl, stir flour, sugar, baking powder, cinnamon and salt together. Using a pastry blender (or tips of your fingers), cut in the shortening until mixture is crumbly. Add the grated apple and raisins, mixing well. Stir in the buttermilk just until mixture is combined. Turn dough out onto a lightly floured work surface. Roll dough in the flour to form a ball and then pat dough out into an 8-inch circle and cut into 8 wedges. Place scones, about 1-inch apart, onto the prepared baking sheet. Bake for about 12 to 14 minutes or until nicely browned. 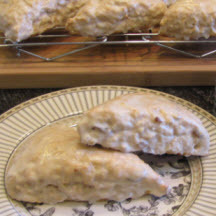 Remove from oven and place scones on a wire rack which as been set over waxed paper to catch the drips. Generously brush the glaze over the tops and sides of scones. Allow glaze to set before serving. For the glaze: Combine all ingredients with enough milk or water until consistency is thin enough to use a pastry brush to apply it onto the scones. Store any leftovers in a very loosely covered container. *Any type of apple will do, although I prefer the tart flavor of green apple in contrast to the sweet glaze. **Apple juice or water can be substituted. Tip: For variation, substitute the golden raisins for other dried fruit such as cranberries or cherries. Nutritional Information Per Serving (1/8 of recipe): 292.4 calories; 29% calories from fat; 9.9g total fat; 8.8mg cholesterol; 375.3mg sodium; 128.0mg potassium; 47.5g carbohydrates; 1.4g fiber; 21.4g sugar; 46.1g net carbs; 4.3g protein.